What could you accomplish if you knew the answers to these four questions? When you have answers to these four questions followed with a plan to initiate timely, relevant, and results focused actions to grow, your business goals will be achieved. 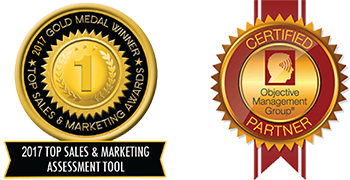 Sales Pro Insider is a certified partner with the Objective Management Group – Sales Effectiveness & Improvement Analysis. SEIA is the most accurate and customizable online assessment tool available for business to business selling environments. The predictive validity is 95% and each assessment is configured to the specifics of your sales strategy, industry, team and objectives for sales performance improvement. Why did we select OMG as our partner? The OMG analysis and assessments provide the timeliest and most accurate insights for growing sales, profits and market share. The insights allow us to look at your people, strategies, and systems to tell you whether your people can actually execute the company’s strategies, meet your expectations and belong in the roles they are in. You’ll learn which of your existing salespeople could be performing two, three or even four times better. You’ll discover what you must do in order to help those people achieve their potential. You’ll understand which of your people won’t ever perform any better than they do right now and why. We analyze your pipeline for quality and quantity and report on the effectiveness of sales management. Can your sales people execute your strategies? What impact is sales management having? Do you need to change your selection process or your hiring criteria? Who has potential for growth? How much potential do they have? What will it take to achieve that growth? What are the biggest challenges for the sales force to overcome? How far are you from having an over achieving sales force? Do your systems and processes adequately support the strategies and the sales force? How must we improve to reach our short and long term goals for growth? Information is only helpful if it is actionable. The output of your Sales Effectiveness & Improvement Analysis will tell you how much better you can be and will provide a specific roadmap for sales performance improvement. Sales Pro Insider works side-by-side with you in a 2-3 hour session for configuring the sales performance improvement benchmark. Role Based on-line questionnaires are completed by each member of your sales team. This takes approximately 1 hour per team member. A Sales Pro Insider principal reviews the findings along with a prioritized list of actions. 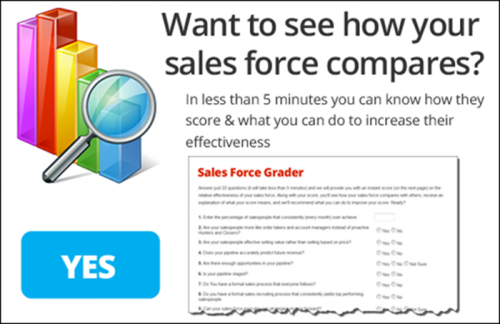 To get a quick view of your team, click the graphic below to take the Free Sale Force Grader. The results are immediate.